Women gathered at Apex Lodge during the pre and post election meeting. 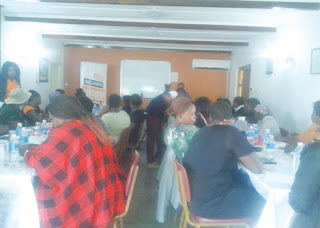 GWANDA -Women attending a Women’s Coalition in Zimbabwe workshop expressed shock at the low representation of females in political positions either in political parties or in Parliament and council. It was noted for example that Gwanda North has five female councillors out of 34 wards. In Parliament women make up only 32% of the Parliamentarians. Thirty - five women from Gwanda urban and rural gathered at Apex lodge where the agenda was to discuss pre and post election period concerning women. Schasisile Ndlovu, the events coordinator of WCOZ highlighted to the women that there are many conventions that promoted the equal representation of women in politics and other areas. She said that Zimbabwe had signed CEDAW, Beijing and the country’s constitution also upholds the rights of women. Section 56 of the Constitution calls for gender equality in governance and administration. Women agreed that the right place to start the gender parity struggle is in the political parties where they should demand their quota. They said women should demand quota allocations right from primary elections. “I urge women to go back to their political parties and lobby for the quota system which is in the constitution, women’s participation is below 50%, considering that it is 32% in the National Assembly” said Schasisile Ndlovu, the events coordinator of WCOZ. Women were urged to support each other in their bid to fill up their quota and warned against leaning on men as that sometimes leads to sexual abuse. WODAZ manager Juliet Nkiwane said there are reasons why women do not support each other and those must be attended to and addressed. She said that there is a belief that men deliver on pledges better than women. “We need to identify and groom our women for leadership. Their political lines must be forgotten and they need to be supported as women not as daughters of a certain political party,” said Nkiwane. The women were also encouraged to have income generating projects to avoid handouts which expose them to dependency on men for financial support.